Business Analyst Program from QBI Institute is a much sought after program by Domain Experts, ITES Professionals, Software Testers and Project Managers. Till date several hundred participant have successfully completed this program and today they work as IT Business Analysts and Business consultants. The IT Business Analyst role is a rewarding and challenging role in IT industry. Today IT Business Analysts acts as a crucial link between software development team and the client team. To help transit Software Testers, Software Developers, Domain professionals, Students, Individuals starting or restarting their careers take up Business Analyst positions at an appropriate level. 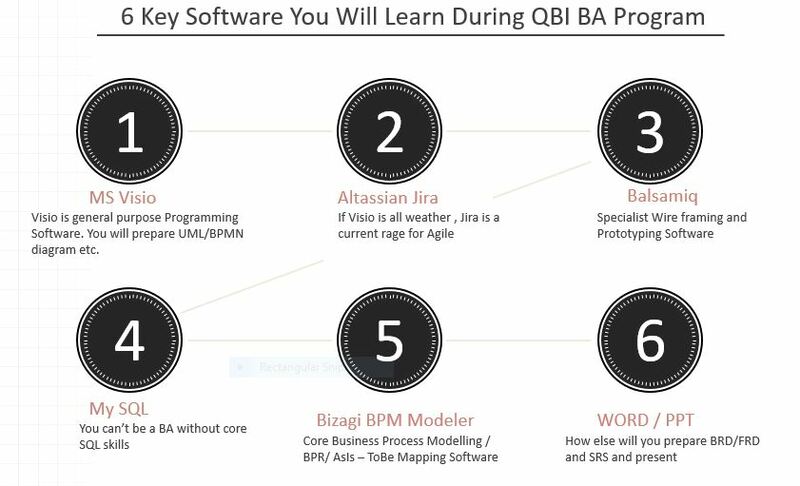 To equip Business Analyst Program participants up to date training in IT business analyst software like Microsoft Visio, Balsamiq, My SQL, JIRA, Word and Bizagi Business Process Modeler. To provide uptodate training in the complete Requirements process (Requirements Formulation of a software project. Attend live online classes / live webinars twice every week. © Copyright QBI Institute 2010- 2017 ALL RIGHTS RESERVED.